My bro was inquiring, would like a confirmation if we could sneak it in. no sneaking. even a vehicle that runs at other events with a stiffened aftermarket suspension has been shown to be questionable. That much body roll on a vehicle that high can be a problem (in the event of recovery). and there's this bit of advice from another body. On properly stiffened and lowered suspension it may garner a test. If the exec isn't prepared to accept the risk it's out. Car is ready, but I having doubts. Honestly I watching my pocket. If event shutdown, I out 500 bucks. ^^ Cinco ^pretty^ much knows the address. You can massage er I mean message him. wagonrunner wrote: and there's this bit of advice from another body. Van has a widened track, which is why we considered asking. 70.5" tall by 67" wide, which falls within SCCA acceptable zone..
We don't consider the van a 'sports car'.. but a 5 speed high torque diesel would be fun to play with on slower tracks. I do understand the safety / roll over risk, so better safe than sorry then. Yo, what's the course like? 3stagevtec wrote: Van has a widened track, which is why we considered asking. 70.5" tall by 67" wide, which falls within SCCA acceptable zone..
SSF=T/2H . 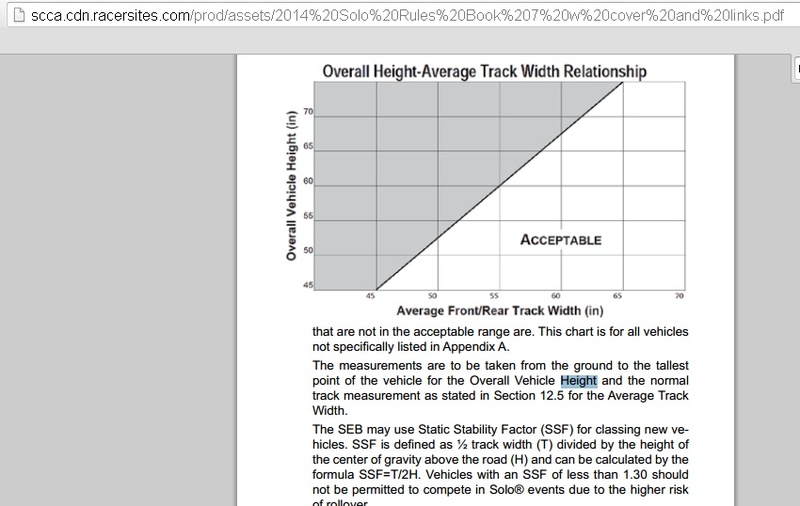 Vehicle with SSF < 1.3 SHOULD NOT BE PERMITTED TO RACE. What about a lowered Datsun 720 and the like? Also just so it wont get lost. moti wrote: Yo, what's the course like? moti wrote: Also just so it wont get lost. I I think it would have some turns marked by rubber cones. You know how to "push" ones buttons eh. Yeah, no chance then.. lol, thanks..
wagonrunner wrote: I I think it would have some turns marked by rubber cones. Gerard, where's the course dude? Those participating are reminded they can edit and print their registration forms. works best in chrome. Please fill it out completely. When we seeing the course ??? ^^ The rate they going................on Sunday. Earlier today we announced the Goodguys 2010 show schedule, but then we were looking at the Goodguys web site and noticed more news. There will now be a class for pickup trucks at the Street Challenge Autocross events, which is way cool. Muscle trucks are big these days, so it’s a good move. El Caminos and Rancheros are also put into the truck class, which seems unfair to the real pickups, but otherwise it’s a pretty neat new feature of the show. BangShift.com sponsor Ridetech is also the main sponsor of the Goodguys autocross events. Here’s the official press release that has the dates of the Goodguys events that include the autocross. National events, trucks 1972 and earlier will be eligible to compete. tech inspection prior to running. Any chance of seeing the course before Sunday? I will be pretty sure to use my first two runs getting lost!